I was on Lequida Owens Sanders facebook page and found a picture of her and another lady called Sophie , does any one know who she is? The women to the left of the picture is Lequida Owens Sanders and the other women to the right is the one I'm trying to find more information. On Lequida Facebook page she calls her Sophie (in blue). 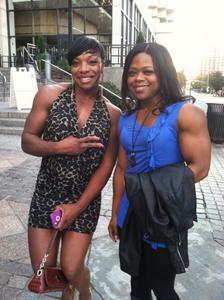 I'm thinking she competes FBB. Wow.. how cool is that :-). Thanks for stopping by and dropping a line Sophia. 1st place and overall winner! Re: Sophia Seals - WaWaWeeWaa~! She is fantastic! Lovely, in fact, and a wonderful person. Sophia, are you still around?